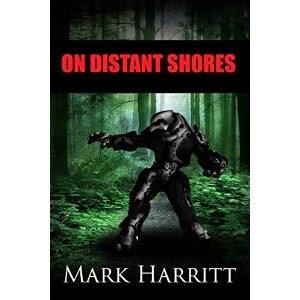 Mark Harritt's On Distant Shores (Earth Exile Book 1) begins with an opening scene where a female dragon whose babies have died due to a disturbance lurks deep within a cave, furious and ready to hunt. Mike is a chief of a SpecOps team who is married but must leave his pregnant wife for a mission that suspiciously isn’t at all specified. The only information he receives is that it is in the US and requires five guys with TS and DOE clearances, and infantry backgrounds. Mike is jokingly referred to as a member of the “Geek Squad”, because they all have backgrounds in the sciences, engineering, or mathematics. Mike and his team discover that they are test subjects for a new invention which is impressive on any scale. They couldn’t have been better test subjects, because they are so in shape, they are essentially athletes of the highest caliber. Although they don't mesh well with some of the "higher ups" in the mission, the crew love them and the invention looks promising. Further along in the book, it turns to the subject of North Korea and their leader. North Korea causes a massive disturbance that touches Mike’s location and affects the whole mission. The scene flashes back to the original dragon scene, and spurs the intensity of the already frenzied situation. And so, a nightmarish hunt begins, in which Mike and everyone who was working with him is involved. This book is a story of survival, chaos, heroic actions, and loss. The story is filled with dialogue between the team and the people they are working with, prodding the plot forward and keeping things fast-paced. The characters are well-developed and fleshed out as the story progressed. Although some of the elements are based on fantasy, the story remains believable and enjoyable. One can tell that the author has extensive knowledge of how the military works, between the military jargon and the team interactions. This book is a good read for those who are interested in the military, survival, or action-packed literature.